Electronic Arts is next to Activision the biggest game producer and publisher. The head office is in Redwood City, California, the German subsidiary is in Cologne. The European subsidiary is in Geneva. Trip Hawkins founds the company Amazin' Software in 1978, with a seed capital of 120.000 US Dollar. Already before the end of the year it is decided that the company should be renamed. The options are SoftArt, Electronic Artists and Electronic Arts. Hawkins is chairman, CEO and at the same time president of the young company. To raise risk capital, Hawkins installs an office in Don Valentin's risk capital company Sequoia Capital. There he creates a plan for a business model, which distinguishs radically from the business model of the established games producers. As does Activision, the programmers are celebrated like stars. They are celebrated as software composers and get talent contracts as known from the music industry. Trip poaches employees from Apple, Xerox PARC and Atari. Sequoia Capital adds further 1 mio. US Dollars and other investors are found. Equipped with a capital of 2 mio. US Dollars, Hawkins opens a shop in San Mateo, California. In the first advertisement campaigns they use slogans as Can a computer make you cry?. These ads also show images of the crew that are photographed by photographers, who mainly take pictures of rock stars. In contrast to all other publishers Electronic Arts sells its games directly to retailers. But they were used to purchasing their products from wholesalers. But for Electronic Arts this direct sale paid off, as the profit margin is higher than the one when trading over distributors. With this Electronic Arts revolutionized the way computer games were developed and sold. The first games are released for Apple II and Atari 800. At the start only slightly successful games are published. The big success happens with the success of the C64. Electronic Arts came on the C64 as a real bombshell. In 1982, already 11 people work for Electronic Arts. A year later the number of employees multiply. 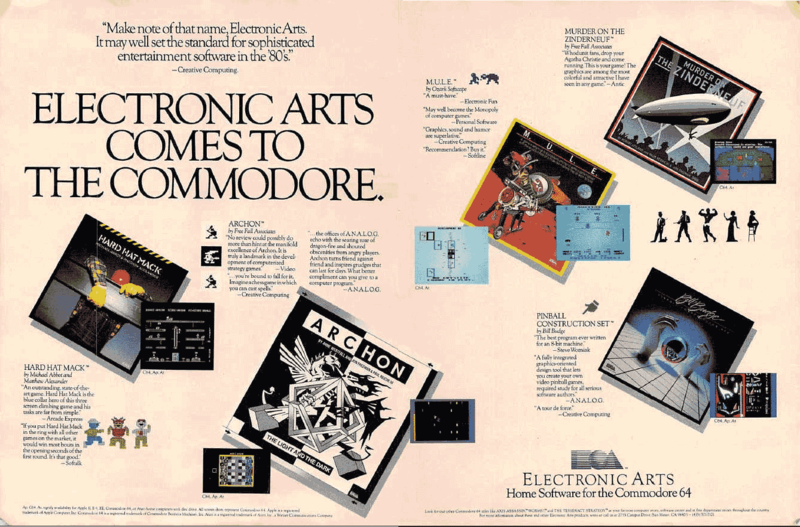 In 1983, Electronic Arts gain 5 mio. US Dollar and a year later 11 mio. US Dollar. In 1984, the gain goes up to haughty 18 mio. US Dollar, which makes Electronic Arts the biggest publisher on the US market. In the beginning, Ariolasoft markets C64 games by Electronic Arts in Germany. Next to computer games Electronic Arts produced from 1985 also the graphics and animation program Deluxe Paint for the Amiga. Later, the program was ported to IBM PC, where it was named Deluxe Paint Animation. On the Amiga the Deluxe Paint had the status of a killer application, which led to a cooperation with Commodore. Between 1987 and 1993 Deluxe Paint was the de facto standard for computer games graphics. The graphics for games were mostly created with Deluxe Paint or its pendant Deluxe Paint Animation until the beginning of the 90s, no matter for which system the game was later published. In the past years EA developed from a strong US Publisher to worldwide greatest publisher of video games. With the takeover of Kingsoft in 1995 the German head office moved to Kingsoft's office. At the start of 2000 Kingsoft was completely integrated and the German head office moved from Aachen to Cologne. Electronic Arts has been criticised in the past again and again. On the one hand because Electronic Arts often buys up smaller studios and has them produce bulk goods and on the other hand because successful games series are continued within a short time. Many studios were closed by Electronic Arts after having produced an only minor successful game. Correspondingly many programmers left Electronic Arts then to found own rival businesses. Electronic Arts also tried hostile takeovers of competitor publishers in the past. An early advertisement by Electronic Arts for Archon, M.U.L.E., Hard Hat Mack and other titles.. 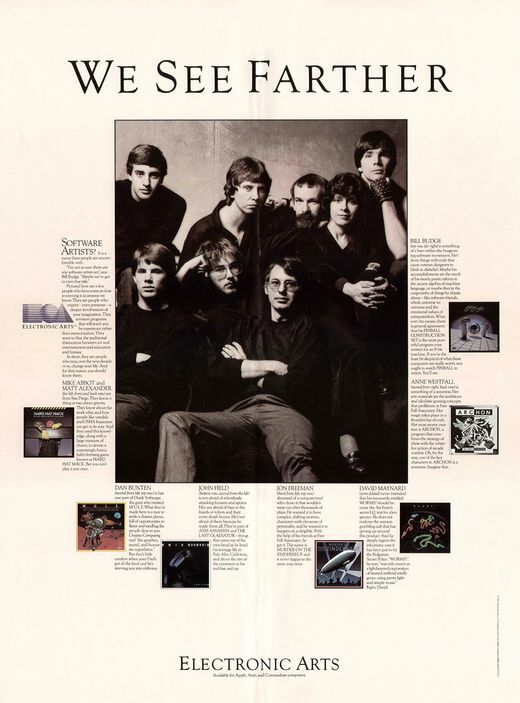 The pioneer programmers at Electronic Arts, played to the gallery in perfect popstar manner. Upper Row Mike Abbott (Hard Hat Mack), Dan Bunten of Ozark Softscape (M.U.L.E., Seven Cities of Gold), Jon Freeman & Anne Westfall of Free Fall Associates (Archon, Murder on the Zinderneuf), Bill Budge (Pinball Construction Set). Lower row: Matthew Alexander (Hard Hat Mack), John Field (Last Gladiator, Axis Assassin), David Maynard (Worms). 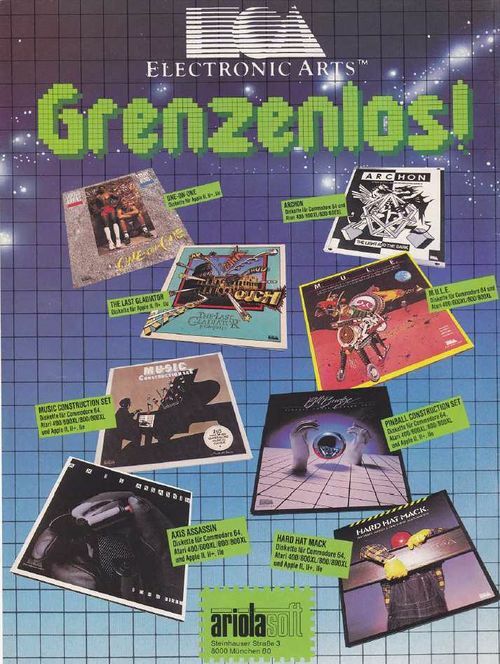 German advertisement by Ariolasoft, which was distributor for several American software houses(amongst others Electronic Arts, Broderbund, Synapse Software). Some games you can see here: M.U.L.E., Hard Hat Mack, Archon, Last Gladiator and Axis Assassin.